TempIDs.com has been servicing our customers with their temporary ID badge and visitor management supply needs for over fifteen years. Wilshire Group is the company name and customers find us from out domain name - TempIDs.com. 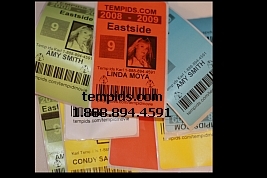 TempIDs.com is the leader in visitor labels, lanyards, and temporary ID badges. Our most popular temp id badge is the sticky label where you can print a picture, name, and other relevant data that looks just like the hard card ID badge. Our custom visitor badge which identifies visitors to your building is a close second. We pride ourselves on doing lanyards correctly whether it is our rush same day lanyards, personalized lanyards, or regular production which are printed on both sides of the fabric. We always operate with our customer as the main focus. Tempids.com is determined to assist our customers with their security needs while still containing costs. We sell high quality products that require low maintenance and are easy to use. Some of our customers are using the same temp id printer they got from us 10 years ago. With tempids.com it isn't about upgrading the customer at every corner to pad our profits. We introduced color labels to temp id badge making as a way to address the issue of people trying to reuse the prior days temporary id. Our customers now mix up the colors to close this security gap. Our self expiring temp badges are another way to address the issue of people trying to reuse yesterday's temp ID again today. The self expiring badge is good for four or eight hours and changes appearance after this time. We also offer custom printed Temporary ID badges where you hand write the name and date because we recognize not everyone has the technology to print a name and picture from the desktop. TempIDs.com is known for their tech support. We have even provided free tech support to friends of our customers because the friends were unable to get in touch with their sales person. We look forward to proving ourselves to you with the opportunity to fulfill your visitor badging, temp id badge, and lanyard needs.